A little over three weeks ago, I planted some radish and arugula seeds in the ground. With a little more sunshine and rain, those crops will be ready to harvest in a couple of weeks. They were the final seeds put in the garden for consumption in the 2014 growing season. They were not, however, the final seeds to be planted in the garden. 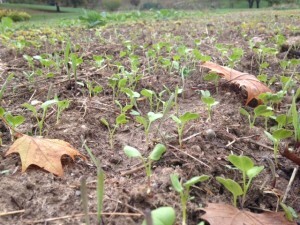 In October, I sowed several rounds of cover crops in the garden. These “crops” aren’t meant to be consumed this year, but they serve an equally important role in the garden. Each time I finish harvesting a given crop in the field, any remaining plant material gets mowed down, then tilled shallowly so the debris can break down and rot into the soil. Most of the microorganisms that do the work of breaking down crops live in the top couple of inches of soil, and you certainly don’t want your micro-organisms, plant debris, and loose soil to wash away now that the soil lacks plant roots to keep it in place. Enter cover crops. Cover crops, as they are aptly named, cover the spaces in your garden that have opened up once you are done harvesting. On a huge farm, whole fields may sit in cover crop while others are used for growing crops for consumption, then they are switched back and forth each season. Because my farm is only an acre, I used every available inch to grow crops this year, but I will have cover crops do their work over the winter. Cover crops will survive cold and even frigid weather, and keep soil anchored through rainstorms, wind, and snow melt. In the spring, they will recommence growing and provide luxurious greens that can be mowed and tilled in to build the soil and provide organic fertilizer for the spring edible crops. This year, I have chosen to use a mix of plants to act as my cover crops. 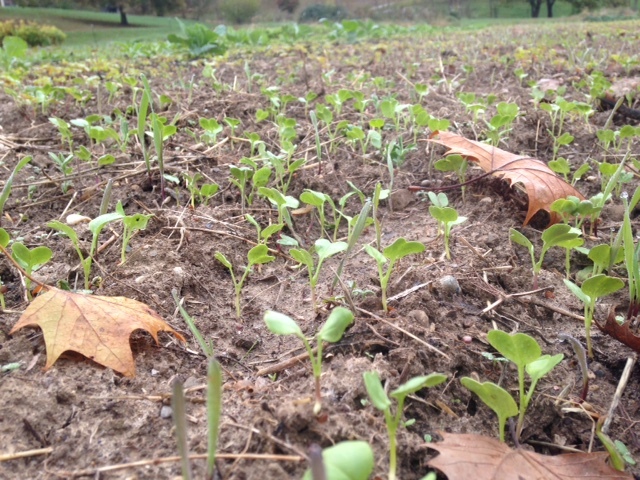 ​Sprouting baby cover crop plants, plant debris, and fall leaves – all will feed the soil! Clover and Austrian Winter Peas are cold hardy legumes, plants that can take nitrogen from the air and fix it into the soil where it can act as a fertilizer. These plants will vine and spread to cover the surface of the ground. In the spring, they will make beautiful blossoms that will attract pollinators to the garden, and the tender tips of the pea plants can be eaten in salads or used in stir fry. Tillage radishes and brown-seeded mustard are both in the Brassica plant family and serve different purposes. Tillage radishes make long, skinny roots which will rot away in the spring and thereby help break up soil compaction and allow air and water percolation through the soil. The brown-seeded mustard plants will make edible greens in the spring, but they will also send up large stalks that will provide vertical structure for the peas to climb. The seed from these plants can be harvested to made spicy brown mustard! Winter rye is the most cold tolerant plant in my cover crop mix, and even if we get another frigid winter this year, it will survive and grow again in the spring to provide lots of biomass that will be cut down and added back to the soil. Over the winter, its deep roots will keep the soil in place. Buckwheat is a plant that is often grown as a summer cover crop because it grows rapidly in the heat and is quite sensitive to cold and frost. I had some buckwheat seed laying around and I sowed it in with my fall cover crops. I know it will die back soon, maybe even tonight with our first freeze, but in the meantime it has grown quickly and is no doubt helping keep the soil in place. It will die off just as the cool-loving crops want more space to spread out. Finally, there are a lot of volunteer cover crops doing their work out in the garden. Some people might call these plants weeds, but I look at them as a free cover crop. Mostly I see henbit or purple dead nettle (I have a hard time telling them apart when they’re little) just starting to leaf out. 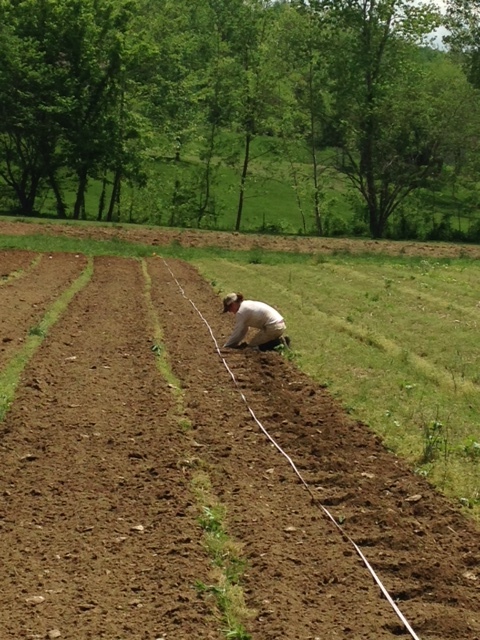 These are low-growing plants that will act as nurse crops, filling in the spaces between the intentional cover crops. What I’m hoping for this winter is a lush, green carpet to cover the bare soil. In the spring, I look for the green carpet to give rise to a beautiful stand of plants with low growing vines, lots of vertical structure, and flowers aplenty. At the moment, our green cover crop carpet is well underway, and with the rain we have been receiving for the past week, it is glowing and growing before my eyes. These plants are happy to be out in the cool weather and are saying, “bring it on!” to the winter. So am I.
Chris picking carrots. The bright yellow-green patches to his left and right are our baby cover crops getting established and covering bare soil in the garden. 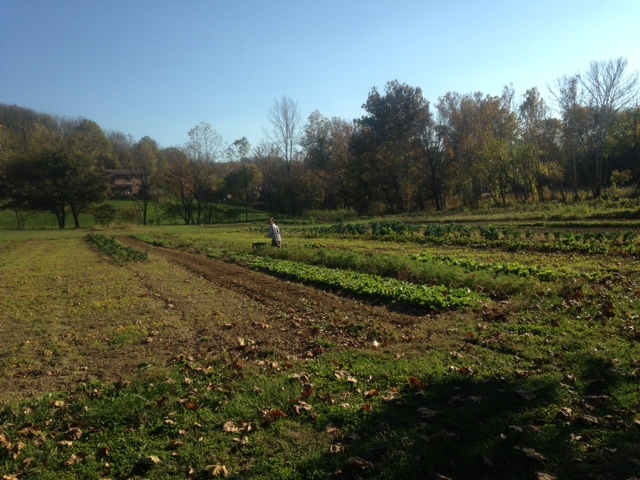 The big news on the farm this week is that we are starting a mini-CSA for the fall. Most farms with a CSA (community supported agriculture), enroll members in the winter before the growing season even begins. Members purchase a share of the harvest for the year upfront, and receive their portion of the harvest throughout the season. In this way, the shareholders help support the farm, especially by providing funds during a time of year when there are a lot of expenses on the farm (e.g., seed purchases, equipment upgrades and maintenance) but no income because there is nothing growing yet! At the same time, the farmer enters into a promise with the shareholders to provide the best of what the farm has to offer throughout the year. It is a fantastic way to build a relationship between a farmer and consumers and create a community that supports an individual farm and its farmer(s). As a shareholder, you are investing your money directly into a farm and farmer, and by doing so, you are supporting the farming practices that you want to occur on the land in your community, and subsequently the kind of food you want to eat. It is a great way to try out new vegetables and recipes, and to keep your kitchen stocked with the best produce throughout the growing season. As a farmer, growing for a CSA helps to streamline your yearly crop plan. You can plan out how many kale plants or heads of lettuce to grow to meet the needs of your CSA, and you can stagger out the crops so there’s always something new ripening each week. You can reduce the amount of time you expend on harvesting, transporting, and marketing your farm goods. 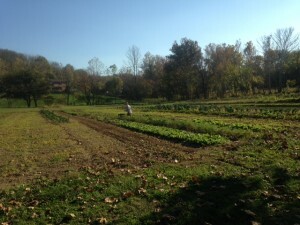 When I first moved home to Kentucky in January to start my farm, I really wanted to have a CSA. However, many seasoned and wise farmers advised me that doing a CSA in the first year is stressful. During your first year farming, you are learning about the soil on your farm, the growing conditions, the climate, the varieties of vegetables that perform well and those that don’t. You’re learning what people like to buy and eat from your farm. You’re learning which crops get hammered by pests and which thrive. All this “learning” is actually just you making mistakes and realizing what you need to do differently next year. The wise and all-knowing seasoned farmers cautioned me that it doesn’t feel good to look at your fields and realize that you don’t have enough vegetables to provide for your CSA members. Then you have to decide who gets a tiny or really awful looking head of lettuce and hope that particular CSA member doesn’t drop their share next year. So I heeded this advice and decided that the best option for selling vegetables during my freshman year of farming was to go to the farmers market. At the farmers market, I can take only the nicest vegetables from the farm and leave the ugly stuff behind to eat myself. It doesn’t matter if I have exactly 20 bunches of kale, I can bring as many bunches of kale I want! I can even come some weeks without kale if it looks horrible! This has been a fantastic way to get my feet wet this year. No matter what is happening on the farm, each week I bring the nicest, freshest vegetables and primp them up to look nice on my market table (If you’ve seen the multi-tiered burlap and wicker basket extravaganza that is our farmers market display, you know what I’m talking about). When you look at our stuff at the farmers market, you have no idea that we have a whole 150-ft bed of spinach that looks like crap back at the farm, because we don’t have to bring it to the market! You don’t get to see the 300 heads of radicchio that got eaten by deer, you only get to see the 7 nice heads of radicchio that survived. I have learned so much this year, and I am hopeful that my vegetables next year will be even better for all the mistakes I have made. 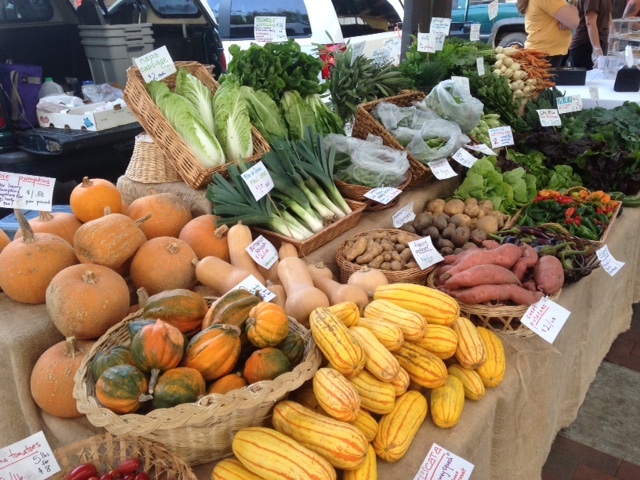 Our farmers market spread: baskets, burlap, and piles of vegetables aplenty. There is a drawback to selling at the farmers market, though, and I like to call it “The Bengals Effect.” To illustrate the “Bengals Effect,” let me just tell you a little story about two different Sundays at the farmers market in Cincinnati in September. On the first Sunday, the sun was out, it was dry, a few clouds in the sky. The high temperature was 79 degrees. Overall, it was the perfect kind of day to walk around and go to the farmers market. On this particular Sunday, the Bengals had a home game at 1PM, right during the farmers market. Now, if you don’t know much about the residents of Cincinnati, I will tell you that they love their Bengals. They love their Bengals just about as much as they love drinking beer and celebrating their German heritage. Well, it just so happens that Oktoberfest was also underway on this particular Sunday. So what was happening back at the farmers market? Even though it was a lovely day and our table was looking majestic, covered with colorful winter squash and beautiful leafy bunches of kale, and dozens of other fresh vegetables, no one was at the farmers market. We sold $342 worth of vegetables. The next Sunday, the weather was the same, sunny and beautiful, not too hot or humid. We had the same vegetables. We had the same set up. We sold $597 worth of vegetables. The Bengals had a bye that Sunday. Are you getting the idea here? Whatever the reason, a Bengals game, nice weather, crappy weather, a traffic jam, a big event in the city, it is very difficult to predict how many vegetables you will sell at any given market. No matter what, Chris and I go out and spend hours harvesting for the market and some days we come home from the market with armloads of vegetables, and others we come home with no vegetables and a nice wad of dollars in our pockets. On the bad days, you feel like you wasted a lot of time harvesting vegetables for the market that no one bought, and on the really good days, you kick yourself for not picking more! With a CSA, a farmer knows that she has to provide enough vegetables for, let’s say, 20 families. Then she can go out in the field and pick 20 bunches of kale, 20 heads of lettuce, 20 bunches of turnips, 20 bunches of basil, and so on. She doesn’t waste any time picking too much or too little of any crop. 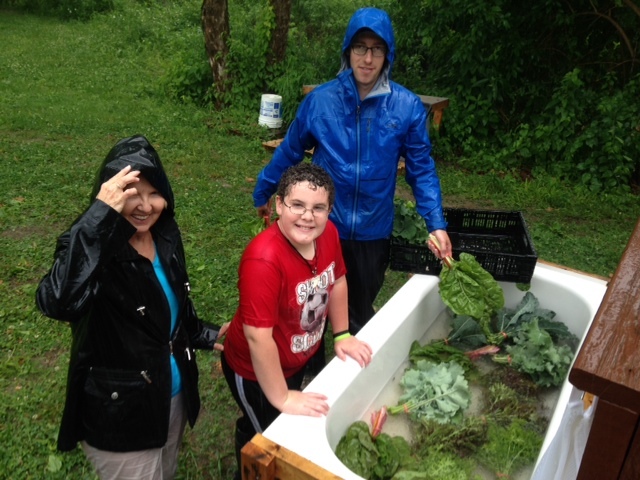 She takes the vegetables directly to the customers and they pick it up, even if it is rainy or the Bengals have a game! There is very little waste when farmers and customers enter into a CSA together. It is a beautiful thing, and that’s why we have decided to do a little trial CSA this fall. I have been looking over my fields this fall, seeing the abundance there, and wondering if I’ll be able to get those vegetables into the hands of people hungry for wholesome, nutritious food, and whether that depends on the Bengals’ schedule. Therefore, I have decided that with vegetables a-plenty, and the growing season almost at a close, it is time to give the CSA model a whirl. Chris and I will be delivering our first set of CSA shares this Friday, and we will do another delivery on Friday, October 17. We already have in mind what we will be putting in the shares each week, we know that those crops are thriving out there in the field, and we are excited to hand those veggies off to our CSA members. We hope that it works so well that we’ll do the CSA for the full growing season next year. We aren’t giving up on the farmers market, though. Even though sales aren’t stable through the year at the farmers market, we love being there. We love meeting new customers, seeing our regular customers, sharing recipes with people, talking to other farmers, and eating lots of delicious baked treats while drinking sweet tea (me) and lattes (Chris). We love being present at the market, getting off the farm, and talking to people who love food as much as we do. Water has been on my mind lately. Mainly because I was worried that my plants weren’t getting enough of it during the final weeks of May. Until a few days ago, the top few inches of soil in the garden were turning dusty dry and the flow of the creeks running alongside my garden had turned from a gush into a trickle. While neighboring farms were busy irrigating their crops, I was busy doing a rain dance because…full disclosure here…I don’t have an irrigation system set up yet. 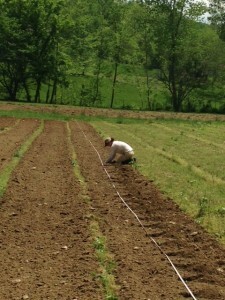 I have a long to-do list for the farm, and setting up irrigation has been on that to-do list for a long time. I kept shuffling it to the bottom of the list because Mother Nature has been providing consistent rain or thundershowers (or snow) since my first seeds and plant babies went out into the field in March. So instead of looking my irrigation (or lack of irrigation) problem in the eye, I focused on other farm projects. Also, I have to admit, irrigation is a topic that makes my head spin, which is probably why I have procrastinated so long. To irrigate crops, you need a water source and power to deliver the water to the crops. While I’m lucky that I have creeks bordering three sides of my farm, they don’t always hold water consistently throughout the year, and I don’t have an electric source anywhere near my field, so I need to have an alternative power source to pump water from the creeks. Another disclosure – I would rather not have to water at all. If I can get all of my water in the form of rain, it saves me a lot of time and worry. Plus, plants tend to be better at growing deep, water-seeking roots if you don’t water them too much. If the surface of the soil is consistently wet from regular irrigation, the plants will form shallow roots that stay near the surface and easily dry out when they aren’t irrigated. Normally, here in Kentucky, you can bet on warm rains throughout the summer, but we have experienced drought years, and who knows what will happen this summer, so I’m biting the bullet and buying irrigation equipment in case we have an unusually dry summer. Now I’m tackling the confusing-to-me subjects of water pressure, friction loss, filtration, and the puzzle of putting together pumps, fittings, pipes, hoses, valves, and nozzles. On top of all that, I have struggled to find a local irrigation supply store that carries agricultural irrigation products for small scale growers. There sure do seem to be a lot of lawn irrigation contractors and suppliers out there, but not a lot of options for people growing things other than grass. The nearest agricultural irrigation store I could find was in Lexington. I could try and order everything online, but I really wanted to talk to an expert and see how all those little fittings, hoses, and whoozeewhatsits go together before I purchased them. So, earlier this week after some hot days with no rain, I decided to drive to Lexington and talk to the fine people at Kentucky Irrigation. Now I’m the proud owner of some drip tape, a filter, pressure regulator, and various fittings. I still need to purchase a pump and a large diameter hose or pipes to deliver water from the pump up the field, but all of that can wait a little longer because my rain dance paid off – on Wednesday, we received an inch of rain. As luck might have it, most of it fell during the few hours we have to harvest vegetables for our Wednesday farmers market, but I’m not complaining. The plants are thriving now in moist soil and I get to procrastinate my irrigation problem for a little longer. ​Working hard to get squash transplanted, but will they survive the cold? Around mid-March, I almost let it make me crazy. I was losing sleep at night wondering if my plants were going to survive in my unheated greenhouse during those weird 16 degree nights. I couldn’t decide if I should buy a heater for the greenhouse, move the plants inside my cramped trailer kitchen, or wait it out and see what would happen. If I lost my plants, I’d have to re-do all my seeding and then fall behind on my planting schedule, and consequently have a big gap in what I could bring to the farmers market in the spring. Indecision was swirling around my brain. I finally realized that I had to let go of all of that worry. Nature is unpredictable and I can’t be in control all the time. Sure, I could run out and buy expensive equipment to heat my greenhouse, or I could buy extra fabric row cover and cover everything in the garden, or I could buy equipment to mist the plants overnight to prevent frost from settling on the leaves. But that’s not what my farm is about. I’m trying to grow things in tune with nature, and nature is variable, sometimes violent, and certainly not sterile, or controlled. The plants have to deal with this variability, and so should I. One of my farming mentors, Bob Cannard, used to tell me and my fellow student farmers, “50% for humans, 50% for nature.” By this he meant that only half of a farm should produce food for people to eat. The other half should go to all the other consumers in nature – the bugs, the rabbits, the deer, the soil microbes. It’s easy to get greedy and try to grow and sell as much as possible on a farm, especially when you have bills to pay. However, when we sacrifice some crops to all the other eaters in the world, the farm becomes a much more fertile and healthy place in the long run, and we can let go of chasing after the latest gadget or technology that will “save” our crops. As the farmer, I can get caught up worrying about killing frosts, insects eating my crops, or deer destroying my garden, or I can face challenges as they present themselves, and let go of the reins a little and trust that things will work out in the end. So what if the temperature drops low enough to kill my summer squash tonight? I’ll just have to re-plant them or plant something new in that space. In the meantime, my kale might grow more happily, some insect pests might die too, and the newly dead squash vines will compost into the soil to feed the next crops. 50% for humans, 50% for nature helps me to sleep a little better at night, and I’m thankful that Bob taught me that lesson. Matt on Welcome to our website!